First of all – all seven candidates were there. Typical of a Republican Primary, there are far too many candidates in the field. Notable, this was the first time Mik Mikaluco and Gabriel Hydrick were at an event that I am aware of. Suzanne Jones was also present at this forum. The bulk of this update will focus on the three opponents to Bill Halldin that have some level of funding. Cristi Nelson is positioning herself as the liberal Republican in this race. As a political insider, I remember when the massive independent expenditures that were financed in part by Chevron, PG&E, the Realtors, the dentists and a few others targeted safe Republican seats in hopes of helping elect tax-raising Republicans. My first thought is that someone has advised her that going full RINO jacket will get her that support. It is the only possible reason why someone would openly talk about their refusal to sign the “no new taxes pledge” in one of the most conservative districts in California. It is the only possible reason why she openly talks about her country-club liberal social views. The part that Nelson seems to have missed is that those expenditures were largely ineffective and in 2014, were quite sparse. Kevin Kiley brought about 10 supporters with him who comprised about a quarter of the audience. Despite failing to achieve has lofty fundraising goals, the 30 year old Lawyer is continuing on with his campaign. The #AD06 Race is going to be intense and these candidate forums will be nice miniature train wrecks similar to the national spectacle that suffices for a GOP Presidential Primary. #1 Local Business PAC Endorsement. #2 ONLY Candidate to make the cut for Trailblazers. Good morning. I am excited to announce more positive news for the campaign. The Political Action Committee of the Roseville Area Chamber of Commerce, the largest local chamber in Assembly District 6, has unanimously endorsed our campaign. I am honored to have the support of this important group. Please see the news release pasted below. Also, California Trailblazers, an influential program to train and support up-and-coming Republican leaders, has awarded our campaign its “Pathfinder Status” — the only candidate in the Assembly District 6 race to be recognized. Click here to see the California Trailblazers news release. While we are building momentum, I remain focused on raising the money necessary to be successful in the June 7 primary. As we close out February, we are trying to hit some key fundraising goals. I would greatly appreciate any contribution of any size you could make online today. Below is an invitation to my next fundraising event, coming up on March 9 and hosted by DF Properties and Denio’s Farmers Market in Roseville I hope you can join us. 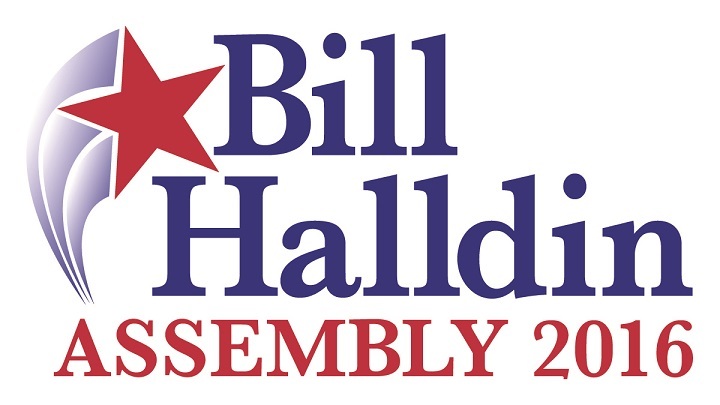 ROSEVILLE – The Roseville Area Chamber of Commerce Political Action Committee has unanimously endorsed longtime local small business owner Bill Halldin (R-Rocklin) for the 6th Assembly District, which includes South Placer County and parts of Sacramento and El Dorado counties. The Roseville Area Chamber is the largest local chamber in the 6th District. Assembly District 6 is currently represented by Beth Gaines, who is not seeking re-election due to term limits. Bill’s firm, Halldin Public Relations, has been recognized over 20 times for innovative and outstanding work by the Sacramento Public Relations Association. It was also named one of the 100 fastest-growing businesses in the Greater Sacramento area by theSacramento Business Journal. Bill was selected as Business Person of the Year by the Rocklin Chamber of Commerce for his commitment to excellence and is a past recipient of William Jessup University’s Faith & Service Award. Bill currently serves as a Trustee for Sierra College and on the board of a number of civic organizations, including Blue Line Arts, the Roseville Area Chamber of Commerce, the Sacramento Region Feed My Starving Children MobilePack Steering Committee and the Sierra College Foundation. He is a past chairman of the Rocklin Area Chamber of Commerce and the William Jessup University Community Relations Council. The Roseville Area Chamber’s PAC is the second business PAC to make an endorsement in Assembly District 6. The Sacramento Hispanic Chamber of Commerce PAC also chose Bill Halldin. Bill and his wife, Susan, live in Rocklin and are the parents of two children, Kathryn, 18, a freshman at Wheaton College, and Michael, an 8th grade student at Spring View Middle School in Rocklin..
To learn more about Bill, please visit: www.BillHalldin.com. Election Day is closer than you think! We need help to ensure a victory in the June 7 primary. We have recently updated our “Get Involved” site. Please sign up — or update your sign up — to volunteer, endorse Bill, donate or host an event. We are currently scheduling informal coffees at homes throughout the district — a great chance to invite your friends of meet Bill. District 6 stretches from South Placer to Orangevale, Fair Oaks and Folsom in Sacramento County and El Dorado Hills, Cameron Park and Latrobe in El Dorado County. Click here to see a detailed map of the district. ICYMI: John Moorlach Skipped The SB277 Vote And Did Nothing! This is proof that John Moorlach was not ready to govern once elected and kind of backed in to the job. Orange County deserves better than an absentee Senator. He ran for State Senate earlier this year. He should have known that he’d be needed to stand up for us. However, he had other priorities. Mr. Moorlach even celebrated leaving Joel Anderson behind and on his own. Oh mama, this is getting bizarre quick. I’d imagine that the anti-vaxxers are going to be wanting to burn Moorlach on the mercury altar over this. How many other votes has John Moorlach missed? Does he even care? On the heels of the exposure on this blog, Beth Gaines told the GOP Assembly Caucus at their weekly meeting that she was not running. Why did she have to get publicly humiliated to force her hand? There is no word if Ms. Gaines made an endorsement.